Occasionally mSupply will show negative stock balances when running reports to view stock levels at a past date. This may look to be wrong but in many cases this is mathematically correct. You may have entered backdated customer invoices using the current available stock. Here you would have created a customer invoice, but modified the confirmed invoice date to reflect past transaction. You issued backdated placeholder lines on confirmed invoices using the current available stock. Initially when you created a customer invoice, you had no stock but had to resort to placeholder lines. 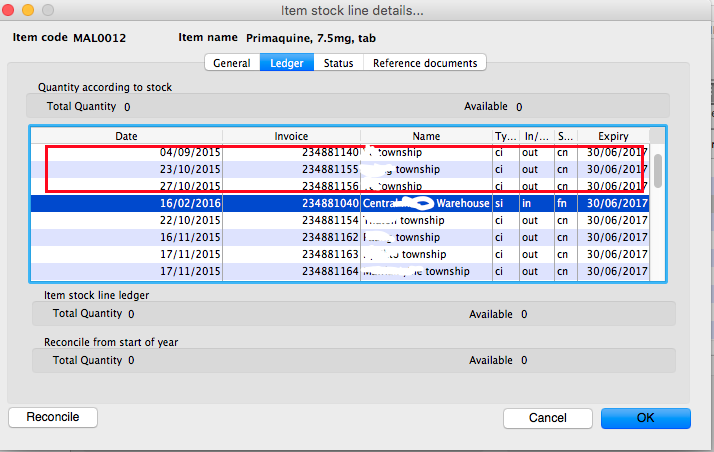 After receiving stock, you re-open the old confirmed customer invoice to issue the placeholder lines with recently available stock. In both the cases if you were to report on stock level at a certain point ( the date before you receive supplies), then you may get negative stock values. mSupply to calculate stock level at a certain date needs to work back from current stock level. So if your data shows that you have issued stock that you haven't technically received due to the order of the confirmed date, then you are likely to see Negative stock balance. The image below shows a ledger for a single batch that was received in 16/2/2016, but between 04/09/2015 to 27/10/2015, the stock has been issued inside three backdated invoices. Previous: The Help Menu Next: FAQ: How Do I Remove Stock Lines That Have 0 Available?